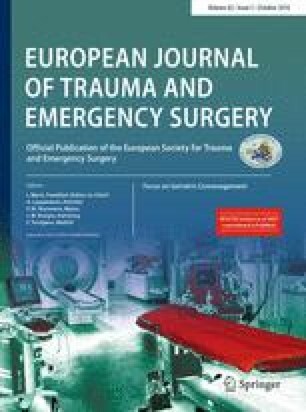 Open surgical management of unstable pelvic ring injuries has been discussed controversially compared to percutaneous techniques in terms of surgical site morbidity especially in older patients. Thus, we assessed the impact of age on the outcome following fixation of unstable pelvic ring injuries through the modified Stoppa approach. Out of a consecutive series of 92 patients eligible for the study, 63 patients (mean age 50 years, range 19–78) were evaluated [accuracy of reduction, complications, failures, Majeed-Score, Oswestry Disability Questionnaire (ODI), Mainz Pain Staging System (MPSS)] at a mean follow-up of 3.3 years (range 1.0–7.9). Logistic multivariate regression analysis was performed to assess the outcome in relation to increasing patient age and/or Injury Severity Score (ISS). Out of 63 patients, in 36 an “anatomic” reduction was achieved. Ten postoperative complications occurred in eight patients. In five patients, failure of fixation was noted at the anterior and/or posterior pelvic ring. In 49 patients, an “excellent” or “good” Majeed-Score was obtained; the mean ODI was 14 % (range 0–76 %); 50 patients reported either no or only minor chronic pelvic pain (MPSS). Only an increasing ISS conferred an increased likelihood of the occurrence of a non-anatomical reduction, a “poor” or “fair” Majeed-Score, or an ODI >20 %. Increasing age did not impact the analysed parameters. Open reduction and internal fixation of the anterior pelvic ring through a modified Stoppa approach in unstable pelvic ring injuries did not result in an unfavourable outcome with increasing age of patients. We thank Paul Rodham, Newcastle, UK for linguistic help in the preparation of this manuscript. We thank Dr. Daniel Dietrich, Institute of Mathematical Statistics and Actuarial Science, University of Bern, Switzerland for performing the statistical analysis and his assistance in interpretation of the results. Johannes Dominik Bastian, Alexandre Ansorge, Salvatore Tomagra, Klaus Arno Siebenrock, Lorin Michael Benneker, Lorenz Büchler, Marius Johann Baptist Keel declare that they have no conflict of interest. The study was approved by the Institutional Review Board and was performed in compliance with ethical requirements.